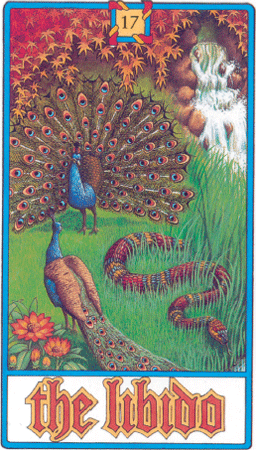 The Libido Card shows us that we are built for joy and happiness and we can find it. We seek pleasure; we shun pain. It is natural and right. Think of pleasure as energy to fuel us in the way that gasoline fuels a car. So the card tells us to remember our own nature and trust in it. It tells us to go and play. It points us to fulfil ourselves in both our romantic and sexual aspects. You can't do your work properly if you don't enjoy it.